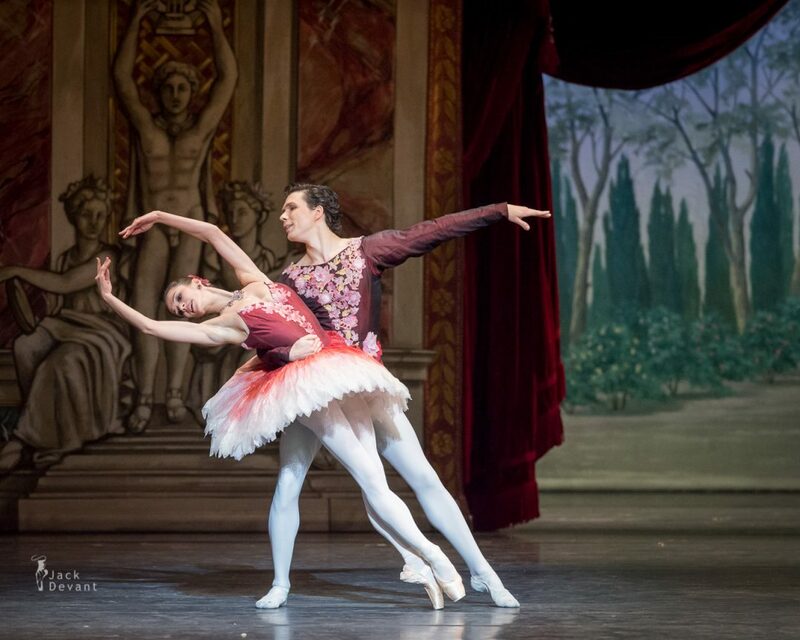 Polina Semionova and Maxim Chashchegorov in Pas de Deux Der Nussknacker (The Nutcracker) by John Neumeier. Taken at 18.01.2014 at Bayerische Staatsoper (Bavarian State Opera). Polina Semionova is Principal with the American Ballet Theatre (ABT). She has born in Moscow in 1984, Polina, studying at the Bolshoi Ballet School in Moscow, Russia, she won awards in the top ballet competitions; including a gold medal at the Moscow International Ballet Competition 2001, First Prize at the Vaganova-Prix Ballet Competition in St Petersburg 2002, and Junior Prize at the Nagoya (Japan) International Ballet Competition 2002. Graduating in 2002, Semionova joined the Ballet Staatsoper Berlin as a principal upon the invitation of Vladimir Malakhov, becoming the youngest principal in the company’s history at the age of 18. She toured Japan as Malakhov’s partner, the reason he had invited her to be a principal in the company. He gave her the lead roles in The Nutcracker and La Bayadère during her first season, following with the role of Tatiana in Onegin, which became her favourite role. In 2003, at the age of 19, Semionova performed with the English National Ballet in Swan Lake, receiving approving reviews from English critics. The following year she joined the California Ballet in their production of The Sleeping Beauty, again impressing critics. Maxim Chashchegorov is a First Soloist with Bavarian State Ballet in Munich. He was born in Russia, received his dance education at the Ballet Academy in St Petersburg. Directly after his graduation he became a member of the corps de ballet from the Mariinsky Theatre and started soon to impersonate bigger roles as the prince Siegfried / Rotbart in Swanlake, Blue bird in Sleeping Beauty, and was for example to see in more modern roles like Four Temperaments (G. Balanchine) and different choreographies of William Forsythe. After his guest-performance as Blue Bird in spring 2007, he now is engaged as a soloist of the Bavarian State Ballet from the season 2007/2008 on. Since 2009/2010 he is a first Soloist. One Response to "Polina Semionova and Maxim Chashchegorov in Pas de Deux Der Nussknacker"
Jack, you have to be the most productive performance photographer on the planet. The gems you return with and share each month are amazing in their quality (and quantity). I really appreciate this website and all the work you put into it.